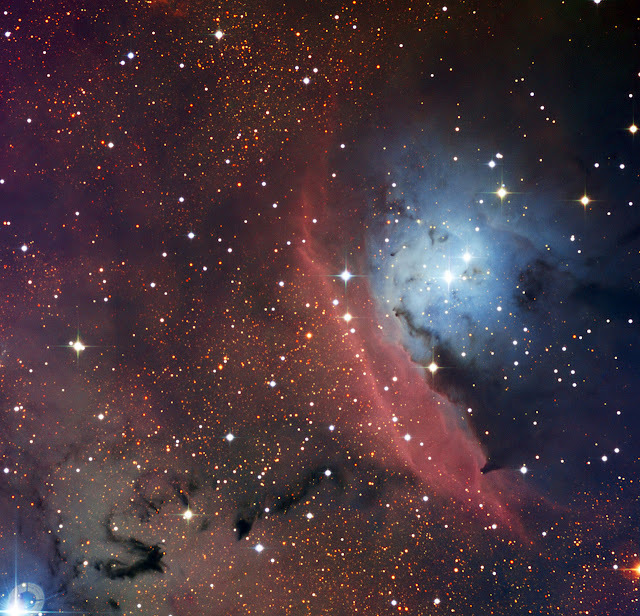 An interstellar cloud of dust, hydrogen, helium and other ionized gases is called a nebula. This region of space is where stars are formed. The materials needed to form stars such as hydrogen and other gases are abundant in a nebula. Stars are formed when dust and gas start to clump together and gain mass. As the mass gets more dense and generates heat, thermonuclear fusion starts and a star starts to form. NGC 6559 is a nebula that was imaged by the Danish Faint Object Spectrograph and Camera (DFOSC) in La Silla Observatory. The colors radiated of the object are from the light given off by the newly formed stars and because of the gasses present in the center gives the nebula a reddish glow and the dust cloud beside it blocks light which gives the nebula a dark and bluish tinge in that area. It is this combination of gas and dust that makes NGC 6559 both an emission nebula in the red part, and a diffusion nebula in the darker area. NGC 6559 is a cloud of gas and dust located at a distance of about 5000 light-years from Earth, in the constellation of Sagittarius (The Archer). The glowing region is a relatively small object, just a few light-years across, in contrast to the one hundred light-years and more spanned by its famous neighbour, the Lagoon Nebula. Although it is usually overlooked in favor of its distinguished companion, NGC 6559 has the leading role in this new picture.